Slots Capital Casino is rather a new comer to the US online casino industry. We love the 1950’s retro look and feel of this top US casino site. The vibe is warm and comforting with a Vegas city background and a 1950s’ chick enjoying playing mobile casino slots. This is a top US casino site that offers online gambling to the Euro market but also accepts US casino players. The Slots Capital Casino offers an Instant Play, Download and Mobile Casino that is a perfect fun and safe gaming operator to play with. Slots Capital Casino offers a very nice 277% welcome bonus to get your online gaming experience kicked off with a bang. Established in 2012 as part of the Deckmedia N.V. group of online casino sites, Slots Capital is powered by Rival Gaming software. Online casinos operated by Deckmedia are some of the most trusted online casinos for US players. Slots Capital and licensed and regulated by the Netherlands Antilles as are the sister casino sites, Sloto’Cash Casino, and Desert Nights Casino. The reputation of the Slots Capital Casino makes our list of best US casino sites to play with for trust and fairness. The government of Netherlands also is avid about closely monitoring the US online casino sites that are under their jurisdiction. The brand name of Slots Capital Casino kind of hints at what their featured games are. Online slot machines are their prime attraction. Using Rival Gaming software, this US friendly casino site does have a massive selection of nice slots to choose from. Online slot lovers who like themed games check out Pigsking Payout, Scary Rich and Fantasy fortune. There are always great bonus features included in all the online slot games featured. Slots Capital Casino also happens to be one of the online casino sites that Rival Casino Software offers exclusive games too. For players who are looking for a bigger payout on progressive slot machine, look no further than Slots Capital. This casino offers some of Rival popular progressive slots like Crazy Camel cash and Major Moolah. One of the attractions of Slots Capital’s online slot games is their mobile slots as well as the iSlots. The iSlots are exclusive to Rival Gaming and have special online slot machines that have interactive story lines and bonus rounds. These unique online slots allow players to become part of a story whilst playing the game. If you are more into table games, Slots Capital Casino also has a good selection of classic casino games such as online Blackjack, Roulette, or Craps. Players can also take their shot at playing online Keno. As for online Video Poker game options at Slots Capital Casino, that is our only black mark. That said, although limited, they do have the favorites such as Jacks or Better, Joker Poker, Double Joker and Deuces Wild. Is Slots Capital Casino Mobile Friendly? US online casino sites have been making forward strides to offer US Mobile Casinos to their players. Slots Capital has a fully responsive website that is nicely optimized for mobile casino players. So if you like playing online slots or online blackjack on your mobile, then you will be pleasantly surprised. With over 45 top quality mobile games, players can play on iphones, Tablets or Android devices. Winning big at Slots Capital top US casino site is now all in the palm of your hands. Are Live Casino Games Available at Slots Capital? 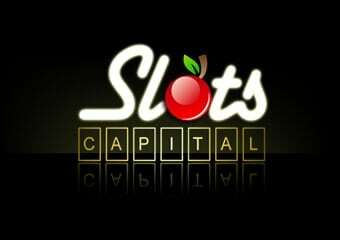 Unfortunately, this is another black mark for Slots Capital. That said, the focus of this US friendly online casino site is Slots, so there is currently no Live Dealer Casino product on offer. Online Casino Gambling USA will keep you updated when they do release a Live Casino. As with all the Deckmedia US casino sites, Slots Capital comes with dedicated support group that prides itself of customer satisfaction. Support agents are available 24/7 and can be contacted via Email, Live Chat or Phone. The Slots Capital Casino website also has a detailed FAQ section that players can check out for most Q&A queries. If players are concerned about securely depositing and withdrawing funds at Slots Capital Casino, they need not. Depositing funds is simple and easy using major credit cards such as Visa, MasterCard. Players can also deposit using Diners Club, Skrill, Neteller, ECO Card, Amex, Ukash and Bank Wire. The e-wallet methods are primarily for Euro players. More importantly is getting your winnings out. Winnings at Slots Capital Casino can be withdrawn easy for US players using Check or Bank Wire. For Euro customers, e-wallet options Neteller, Skrill and ecoPayz. A unique feature at Slots Capital is players can deposit or withdrawal in 5 different currencies. Payout times range from 72 hours to 5 days for US players depending on the method chosen. Going the extra mile for security is important for US casino sites. Slots Capital’s reputation is not only product and service, but also protection. This top online gambling site uses SSL encryption technologies to make sure your data is safe and secure. As for the casino game security and fairness, Slots Capital uses a certified Random Number Generator to make sure all game outcomes are fair. Another unique feature at Slots Capital Casino is that they have a history log that details all your game and transaction history. 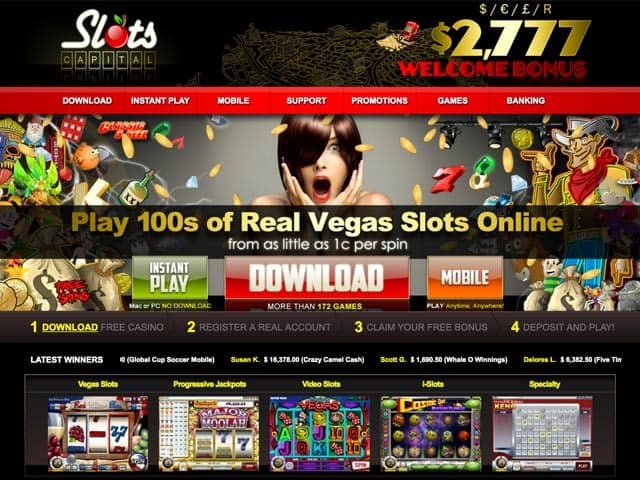 For Slots enthusiasts we highly recommend this US friendly online casino. Especially if you are looking for a safe and secure casino site to play with that has a golden reputation. We can’t say enough good things about the Rival iSlot story-line online slot machines offered at Slots Capital Casino. New members can take this top online gambling site for a spin with a 277% Welcome bonus offer. So go for a spin and we are sure you will have a fantastic online gaming experience at one of the best US casino sites on the market! Join Slots Capital Casino today and receive 277% Deposit Bonus up to $2,777!